This is the reference ticket for the Twenty Seventeen theme which is currently under development, ready for 4.7. 38372.1.patch​ (2.0 KB) - added by davidakennedy 2 years ago. 38372.2.patch​ (3.0 KB) - added by davidakennedy 2 years ago. 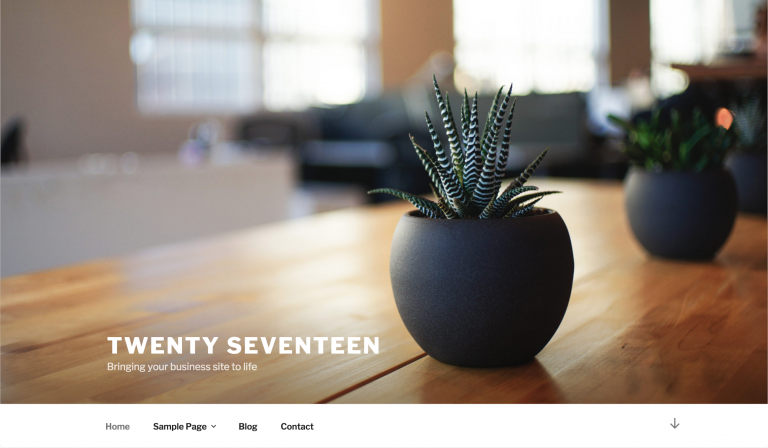 Importing Twenty Seventeen, our new default theme for 2017, set for 4.7. Props melchoyce, laurelfulford, davidakennedy, grapplerulrich, manishsongirkar36, joefusco, smyoon315, b-07, rabmalin, mrahmadawais, hardeepasrani, implenton, acmethemes, claudiosanches, valeriutihai, pressionate, sgr33n, doughamlin, zodiac1978, tsl143, nikschavan, joshcummingsdesign, enodekciw, jordesign, patilvikasj, ryelle, mahesh901122, williampatton, juanfra, imnok, littlebigthing, mor10, samikeijonen, celloexpressions, akshayvinchurkar, davidmosterd, hiddenpearls, netweb, pratikchaskar, taggon, nukaga, ranh, yoavf, karmatosed, sandesh055, adammacias, noplanman, yogasukma, binarymoon, swapnilld, swissspidy, joyously, allancole, rianrietveld, sixhours, alex27, themeshaper, mapk, leobaiano. Twenty Seventeen: Fix a PHP warning on fresh installs. When setting the transport parameter on Customizer settings, we need to ensure the setting exists, particularly on new sites. Tests: Fix tests that don't pass when Twenty Seventeen is the default theme. There are some tests who's outcome can be affected by the default theme, so we need to ensure the Twenty Seventeen functionality is unhooked while the tests are running. Themes: Twenty Seventeen is now the default theme. Twenty Seventeen: Remove some whitespace accidentally introduced in . Tests: Fix ajax tests that fail when Twenty Seventeen is the default theme. should not be necessary, and the previous approach is something that a lot of themes do. Why aren't the customizer settings defined? Their values may be empty, but the setting objects should definitely be there and if they aren't, we should fix that. Themes should not need to do what  does. Tests: Prevent Twenty Seventeen from interfering with Customizer tests. This was previously fixed in , but it wasn't really the correct answer, to fix it in the theme. So,  is reverted in this commit, and the Twenty Seventeen actions causing problems are unhooked before tests are run. Tests: Prevent Twenty Seventeen from interfering with Customizer ajax tests. Install: Update sidebars_widgets option for Twenty Seventeen to match its three sidebars. Nav Menus: Update help text to include the two latest default themes, Twenty Sixteen and Twenty Seventeen. Upgrade: Add Twenty Seventeen to $_new_bundled_files. This indicates that Twenty Seventeen should be installed with a WordPress upgrade.